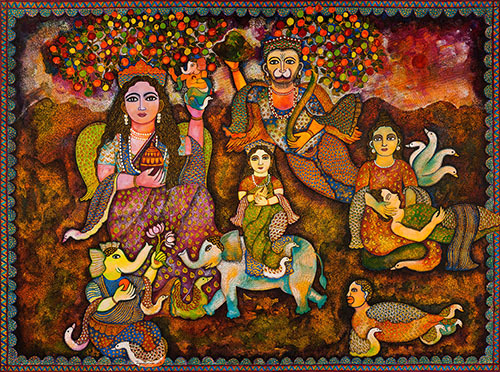 Binodon by Jayasri Burman, Watercolour, 2014. 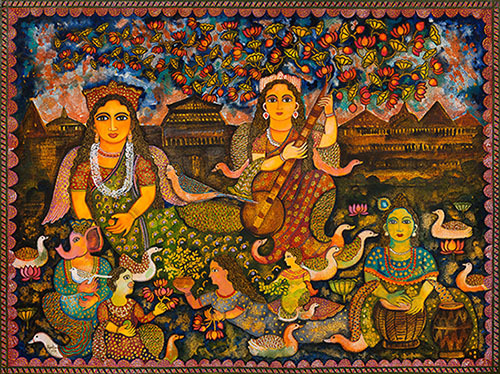 Sanjivani by Jayasri Burman, Watercolour, 2014. 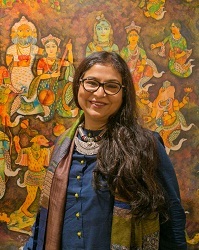 Jayasri Burman, known for portraying Bengali tradition and Indian mythology through her art, is out with Lila, a new show of paintings and sculptures. Over 35 works are a part of the exhibition, the central piece being a large bronze mural depicting tales from the Ramayana. A painting of the same theme complements this mural, and the remaining pieces revolve around these two artworks, merging into one another. Mythical creatures that perpetuate life and love are central to Burman’s storytelling, and are an important part of her paintings. Lila will be on view at Jehangir Art Gallery, Mumbai from November 25 – 30, 2014 and at Art Musings, Mumbai from December 1 – 31, 2014.